On Thursday, March 2, 1905, a young man from St. Louis found solace from the freezing weather that had gripped the nation’s capital in a local Turkish bath. The bath did not have its intended warming effects, but rather, he found himself seized by “severe chills,” enough that the attendants raised the alarm and had him transported to the nearest hospital, the George Washington University hospital at 13th and H Streets, NW. Six days later, small red spots began appearing on the patient’s mouth and tongue – a symptom well-known at the time for indicating the presence of a case of smallpox. Without further ado, the patient was transferred to the District smallpox hospital. 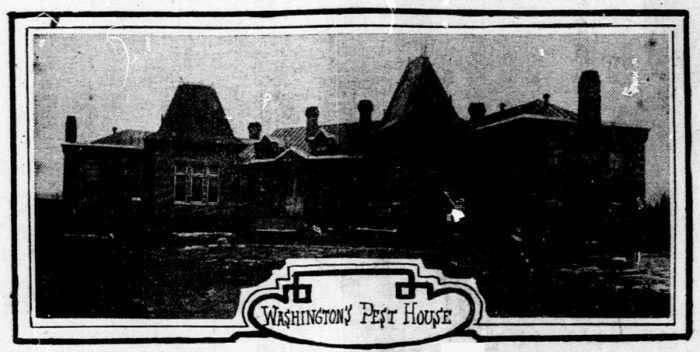 It was at this point that the local newspapers began taking notice, with the Washington Evening Star, Post and Evening Times all reporting on the following day that W. F. Luddington, civil engineer from St. Louis, had been stricken. Three days later, the Times broke the news that the patient had died early that day. Adding to the pathos of the story, they reported that his wife, who had been at her mother’s sickbed, had not been informed until two days before the death, as Luddington had requested that she not be bothered. Only when he was in extremis did he consent. She had left Muncie, Indiana, as soon as the message reached her, but had arrived just before her husband succumbed to the disease. The following day, the Evening Star reported that the latest victim of smallpox had been interred at Congressional Cemetery. So, who was W. F. Luddington? Or William P. Luddington, as the last dispatch from the Star had called him? Nobody of that name exists in the historical record, but there is a Walter S. Ludington, with one D [pictured]. It is under this name that the St. Louis Republic reported his death on March 13. Ludington, whose middle name was Stewart, was born in Indiana on April 23, 1873 to Harley Pulaski Ludington and Emily Cripe Ludington. He served in the Spanish-American war, and shortly thereafter married Maud (or Maude) Wyant. Sadly, she died some five years later; during her illness, she was nursed by Cora Mae Prindle, a widow with two daughters. After the first Mrs. Ludington’s death, William married the nurse. He had come to Washington not for the festivities surrounding Roosevelt’s inauguration, as numerous newspapers posited at the time, but rather to get a patent for a steam regulator. Mrs. Ludington was released on March 30, having shown no signs of having caught the disease. Sadly, the nurses who had taken care of her husband were not as lucky, with nine of them being taken to quarantine, and three eventually developing symptoms. While this was a real problem for their hospital, as those quarantined represented about a third of the nursing staff, all of them recovered and returned to work. There is a bittersweet coda to this story: While she was nursing her sick husband, Cora Ludington was pregnant. On September 16, 1905, she gave birth to a boy whom she named Walter Stewart, after his deceased father.